So you don ’t think you need a will? 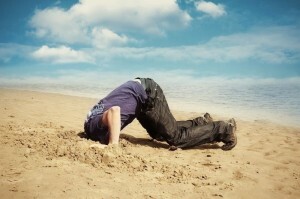 Don’t bury your head in the sand like more than half of all Americans. That’s the percentage of people who don’t have a will…and probably don’t think they need one. Maybe you think you don’t have enough assets to make it worthwhile. Perhaps you think your spouse will automatically get everything. Or you know your children will do what’s right so you don’t have to worry about it. Do you know who actually decides who gets what when you die if you don’t have a will? It’s the government! Yes, every state has laws that determine who will inherit your things if you die intestate (without a will). Your spouse and children will have no choice and will not be part of the process. In some states, it’s simple. Your spouse gets everything. In others, your spouse splits the estate with your children. If you aren’t married or don’t have children, your parents or siblings may be the ones who get it all. You may not want your siblings to get anything or, perhaps, you don’t want your parents to inherit. Maybe you’d prefer that the bulk of your estate goes to charity. Whatever your wishes, without a will, they won’t be carried out. It’s very easy to draw up a simple will. There are many templates on the web or forms you can fill out for less than $100. If you have a complex estate and need to sit down with an attorney, it will cost more. However, for less than $100, you have no excuse. Get a will drawn up today. Don’t let the government make the decision for you. You decide who inherits what when you die. For more information about wills, go to diesmart.com. This entry was posted in Dying Without A Will and tagged diesmart, inheritance, intestate, Probate, state inheritance rules, will on August 23, 2015 by Minna Vallentine. You may have thought that setting up a joint or a pay on death (POD) account or property with one of your children would be a good idea. By titling the account or property in both of your names, your child would avoid probate and could easily gain access to the asset. However good it sounds, it may end up creating problems. Here are three things that may happen. 1) If you have more than one child and only list one child’s name, when you die that child will inherit the entire asset. The other children will receive nothing. If the inheriting child decides to be nice and share with his or her siblings, those siblings will probably have to pay additional taxes on what they are given. 2) If you have a joint account with one of your children and that child gets divorced or a lien is placed on his property, the asset you own jointly may be seized in any settlement. 3) If you name a child on a POD account and that child is still a minor when you die, a court-supervised guardianship will need to be set up until his 18th birthday. At that time, the child will receive whatever is in the account. Before you make decisions about whether to title any of your accounts jointly with one of your children, you might want to speak with an attorney. For more information about this and other important topics, go to www.diesmart.com. This entry was posted in Estate Planning, Joint tenancy, Pay Upon Death and tagged how to avoid probate, Joint tenancy, pay on death account, Probate, trust, will on August 9, 2015 by Minna Vallentine.